Americans have a seemingly insatiable hunger for organic chickens, according to a Bloomberg report. 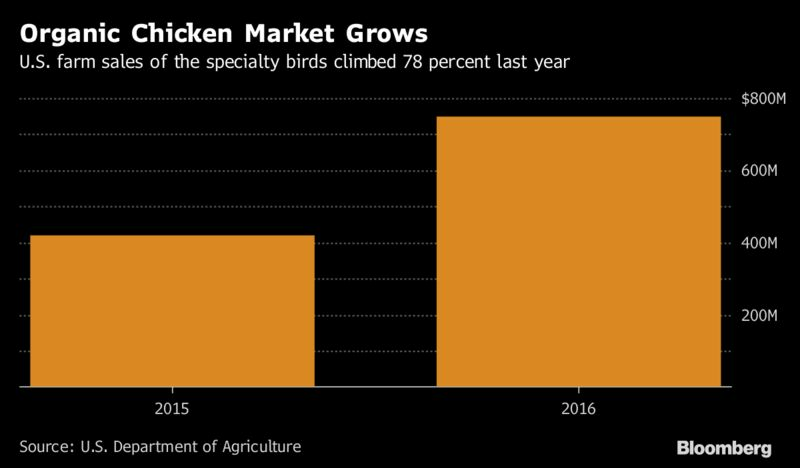 U.S. producers sold $750 million of organic chickens last year, surging 78 percent from 2015, according to data released Wednesday by the U.S. Department of Agriculture. That makes chicken meat the third-largest agricultural commodity, trailing milk at $1.4 billion and eggs at $816 million. Total organic farm sales were up 23 percent to $7.6 billion. More than a third of the value comes from just one state: California. Acres dedicated to the organic food increased by 15 percent, the report showed. Chickens were one of the fastest-growing organic commodities last year. While the segment remains a small fraction of the $26 billion total chicken market, some major meat companies have boosted offerings of the specialty birds. Sales of organic chickens were 100 times greater than organic hogs, the data show. U.S. organic corn production climbed 38 percent last year to 18.5 million bushels and organic soy jumped 45 percent to 4.6 million. That is less than 1 percent of total domestic production of the crops. 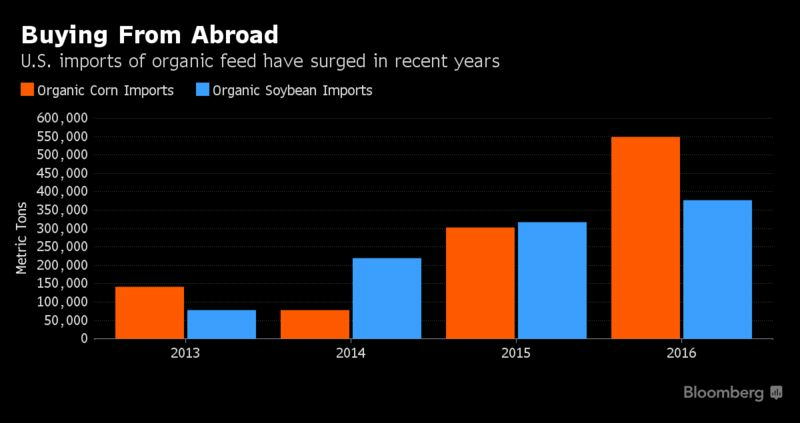 To meet feed needs, organic dairy and livestock producers have grown reliant on foreign supplies in recent years. In an audit posted this week, the USDA’s inspector general highlighted concerns with imports of the specialty crops — including a lax verification system at ports to ensure the cargoes are actually from certified farms.